If the week goes as planned, I will have run about 1600 miles in 2016. And while that might sound like a lot, it’s less than I was shooting for this year, by a little over 400 miles. I took ten entire weeks off: two of those weeks were planned; eight of them were attempts to get past a nagging injury. But the thing that I am most proud of this year is not a particular race or result or the total number of miles that I will have accumulated. What I am most proud of this year is that every time I took a hit, and I took several–one literal–I got back up and kept going. I have run six races (the LA Marathon, the Cooper River Bridge Run 10K, The Biltmore 15K, the BMW 2 miler, The Turkey Trot 8K, The SPACE 5K) and DNS’ed five of them (The Smoky Mountain Relay, The Scream! half, The Myrtle Beach mini, The Tryon Half, CIM). Best race experience: Tough call. Going to go with the LA Marathon even though it was also one of my worst race experiences. I had hoped to BQ at this race. Not only did I miss my BQ by a country mile, but I ran my slowest time of the three marathons I have run. But I learned a lot, and I know that my next marathon will be better. I’m not sure yet which marathon that will be. Best run: I’ve had a lot of good ones since coming back from my injury. There’s nothing like being forced to step away from something to make the return extra sweet. I’m going to go with the 6 miles of trail I ran on Black Friday. I wasn’t sure I should go out to Croft. I hadn’t been out there in a really long time. I didn’t have anyone to go with me. I hadn’t tried to walk or run very far since my October hiatus. I had just raced the Turkey Trot harder than I had any business racing (SOCKS!) I was afraid of getting lost in the woods. . . But I decided to try. If it was terrible, it would be my secret. It wasn’t terrible. In fact, it was pretty awesome. I started running and felt really good, so I just kept going. Worst run: Saturday, May 7. I was running an easy 6. I ran two miles in one pair of shoes, and then I changed into a different pair for the final 4. I ran two miles out, and just about at the turn around point, I tripped. On the pavement, I think, but to be honest, I’m not entirely sure. All I know is that I was running, and then I was flying, and then I was bleeding. I caught myself with my palms, but not before I face-planted, literally. I bit my lip hard enough to draw blood, and for a moment, I was afraid I had broken a tooth (this would not have been the first time, though the other time was when I was 12, and I fell off my bike). A passing pick-up truck slowed down to ask if I was okay. I thanked the driver and told her I was. I got up and checked my legs. I was much more concerned about being able to run than I was about my face. I was shaken up, but running seemed okay, so I ran the two miles home. When I got there, I cleaned out my scraped knee and tried to clean out my palms, which were full of cinders. I also tried to eat something since I hadn’t had breakfast before heading out. It was then that I realized that my jaw was out of alignment. This really freaked me out, so after calling my parents and talking to my uncle who is a doctor and happened to be visiting my parents, I went to the nearest Urgent Care. When I got there and went to check myself in, I couldn’t get my driver’s license out of my wallet (my hands were worse than I had initially thought), and I just started weeping. The staff there were really nice though I don’t think they believed me that I fell while running at first (I had changed my clothes and my shoes). They cleaned me up, x-rayed my jaw, which was swollen but not broken or dislocated, and bandaged my mangled hands. I looked like I had been punched in the face and couldn’t chew, type or do much else with my hands for a few days, but I didn’t miss any of my runs. Best new piece of running gear: I’ve struggled to find my shoe since Nike changed my Holy Grail (the Lunar Eclipse 3). I’ve tried a lot of different options since the “update,” but none of them really worked for me until the Nike Lunar Odyssey. I think that this is the one. I hope. Honorable mentions: Oiselle Spandos base bra; Oiselle Holepunch Distance Shorts. Best running advice you’ve received this year: Stop. Let yourself heal. Most inspirational runner: MFing Kate Grace. Desi Linden, see below, is a close second. Favorite picture from a run or race this year: See below. 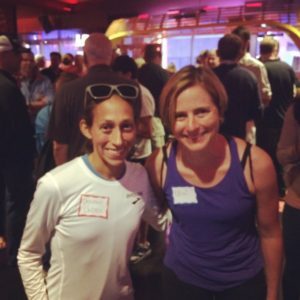 I got to meet one of my Run Heroes, two-time Olympic marathoner Desi Linden, in Los Angeles at the Hansons-Brooks party after a brutal marathon Trials race on 13 Feb.
Race experience you would repeat in a heartbeat: The answer to this one depends on whether I could change anything. If I could change anything, I would repeat the Bridge Run. I think I could have run this one a little smarter than I did. If you could sum up your year in a couple of words, what would they be? What doesn’t kill you makes you stronger. 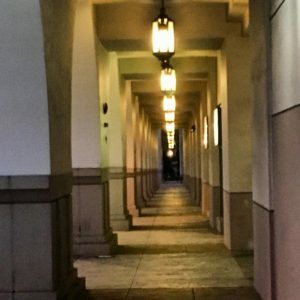 What a great post, Erin! I remember your fall, but did not realize it was this bad; I felt anxious just reading about it! I can completely relate to your concern for running, above all else-ha! I’m so thankful to have been able to connect with you this year; here’s hoping for more running in 2017!